The largest crowd in recent memory to attend a single graduation ceremony at The University of Texas at El Paso’s Don Haskins Center – 10,163 – turned out to cheer for just over 1,000 graduation candidates during the 2018 Spring Commencement evening ceremony on Saturday, May 12, 2018. Graduates give picks up at a recent commencement ceremony. 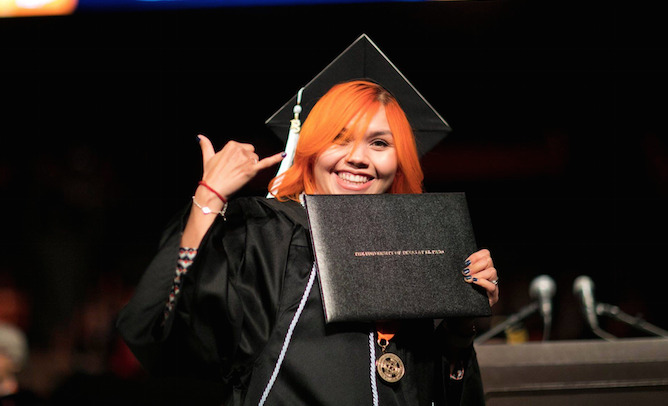 During the day’s three ceremonies, a total of almost 26,000 friends and family members filled the Don Haskins Center to celebrate more than 2,900 graduates and summer candidates. The evening ceremony acknowledged the accomplishments of candidates from the colleges of Science, Engineering and Health Sciences, and the School of Pharmacy. Family and friends continued to file into the arena behind the stage more than an hour into the event as candidates began to cross the stage that was decorated with green plants adorned with orange and blue bows. The large crowd cheered often in support of their special candidates who worked hard to achieve their academic goals. University President Diana Natalicio added her voice of praise to the candidates. She told them that she was genuinely proud of them and their accomplishments. Among the graduates was Juan Sierra Jr., who earned his master’s degree in rehabilitation counseling. The first-generation college student said he was calm for most of the day, but became more nervous as the Commencement ceremony drew nearer. Sierra, who earned his bachelor’s degree in psychology from UTEP in 2013, said he was grateful to the University for providing him with a safe learning environment. The El Paso native said he hopes to open a private counseling practice in Texas, but would not mind moving out of state. In a hallway outside the Memorial Gym staging area, Fernanda Lugo said she already felt that a new chapter of her life was starting. Lugo, an El Paso native, said she decided to attend UTEP because it offered her the Presidential Excellence Scholarship, but it did not take her long to fall in love with the University. Lugo said she will spend the next academic year at UTEP finishing many of the “green” campus projects she championed with the Green Fund and Green Committee, and to learn more about biology to better prepare applications for specialized M.D./Ph.D. programs. Her goal is to see patients in a clinical setting while pursuing research in areas that will serve the public. Eventually, she would like to return to academia, hopefully at UTEP. “This is such a great environment,” said the biology graduate who had a “Go Green, Go Miners” message on her cap and wore double helix earrings. Miguel Fraga is another example of a Miner on the move. He earned his bachelor’s degree in engineering leadership with a minor in biomedical engineering Saturday, but would be on a plane bound for Puerto Rico on Monday to lead a group of UTEP and New Mexico State University students to help build a pedestrian suspension bridge. Fraga, who earned nine scholarships and participated in several out-of-the-country internships and study abroad opportunities, will fly back to El Paso on June 4 to leave for a summer internship at the Lawrence Livermore National Laboratory near San Francisco, where he will research water and wastewater modeling and optimization. After that he will return to UTEP to finish his MBA by May 2019. Eventually, he plans to earn a doctorate in environmental engineering. His goal is to use all his skills and knowledge to create a nonprofit that will assist people around the world to have access to clean drinking water. Two earlier Commencement ceremonies noted the work of graduates from UTEP’s colleges of Business Administration, Education, and Liberal Arts, and the School of Nursing. Jason Chung gleaned an important lesson from his six years of service with the U.S. Army — never have regrets after a mission is complete. The Orange County, California, native carried that notion with him during his two years at UTEP, where he enrolled after leaving the service while stationed at nearby Fort Bliss. That time culminated May 12 when Chung walked across the stage to receive his bachelor’s degree in management with a concentration in human resources management. He was among more than 950 graduates from the College of Business Administration, College of Education and School of Nursing eligible to walk the stage during UTEP’s afternoon commencement ceremony. As he waited inside a boisterous Memorial Gym where graduates gathered before entering the Haskins Center, Chung said there was nothing that gave him pause about his time at UTEP. He graduated with a 4.0 GPA, was a member of the Beta Gamma Sigma Honor Society and was UTEP’s first awardee of the National Society for Human Resources Scholarship, among other honors. A position with the FDIC as a financial institution specialist awaits him this summer in Dallas. What Chung is most proud of, however, is being able to have his father – who was diagnosed with brain cancer in 2017 – watch him graduate. That self-motivation is something President Natalicio said played a significant part in the success of all of Saturday’s graduates. For Marisol Pelayo, those higher expectations were emboldened by her children. The El Paso native didn’t enroll in college immediately after graduating from Bel Air High School in 2001, choosing instead to start a family. But when her youngest daughter told Pelayo she should return to school, the choice was simple. Pelayo already began work with a financial planning firm in El Paso. She is open to the possibility of returning to UTEP for a master’s degree in the future. That chase will begin in earnest for Raul Chavez Jr. The native of McAllen, Texas, said he enrolled at UTEP because he felt opportunity existed in El Paso. He parlayed that quest into a bachelor’s degree in marketing. Along the way, Chavez got a taste of the sports world he loves through an internship with UTEP Athletics. He said he has enrolled in UTEP’s MBA program with a long-term goal of working for the NBA’s San Antonio Spurs. UTEP’s Ceremonial Brass Ensemble fervently ushered in the start of Spring Commencement 2018 in the Don Haskins Center with a rendition of the processional tune “Pomp and Circumstance” in celebration of more than 900 eager spring and summer graduation candidates from the College of Liberal Arts.